My grandma used to say "don't go out with your hair wet, you'll catch the cold." I just knew that for someone like me who air-dries their hair--with the coarse texture that it is--leaving the house means frizzy and crazy hair. But its funny when you lose someone you will hold on to anything that you can that was connected to or reminds you of that person. So now for me, not going out with my hair wet garners the excuse that I will catch the cold if I do so. I don't know if my grandma was right. She wasn't and isn't the only one who had said this to me. My good friend is from Montenegro and has told me several times that leaving the house with wet hair is a big no-no--something to do with the Balkan concept and fear of "promaja." In fact, she didn't like the fact that I air-dried my hair..and it wasn't until I went with her to Montenegro that I realized that people seriously blow-dried their hair out of the fear of promaja. But lets not forget that it is still debated in medical circles if having a wet head can cause you to catch the common cold or not...I think...any which way I guess, we live in a world where things aren't black and white and sometimes things we label as "superstitious" or an "old-wives tales" have a grain of truth to them. And even if not, sometimes these things are harmless traditions or superstitions that we hold on to because they connect us to something more than ourselves and our immediate reality. Anyways, the reason I went off on this, is because I have wet hair in these pictures. You see, as a person that likes to air-dry my hair (it gives me the waves/curls I desire and plus its just better for your hair), sometimes there aren't enough hours in the day to stay at home and wait for my hair to dry--Ive got things to do! places to be! Now, you must be wondering, how long can it possibly take to air dry my hair...well long and I mean long...like 5-hours-ish long. So this day in particular we decided spontaneously that we wanted to go out for our favourite pizza in Vancouver, Via Tevere. And since we didn't plan it, I had to go with my hair wet while it was already raining (not surprised we do live in Raincouver). 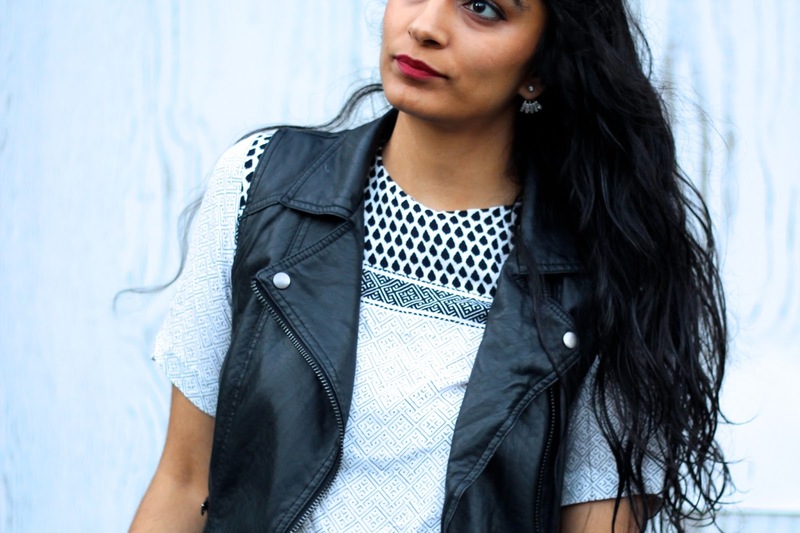 While the rest of my outfit is black and white, I added a little pop with my lip colour! I have also worn this leather vest differently, see here, for the jacket and shoes, see here and lastly, for the skirt here. You have gorgeous hair. The black and white combo is great. I LOVE the whole outfit, especially the moto vest. I have one with gold hardware on it, and I just bought my second moto jacket today! It's burgundy and it's life changing! LOL! Great post! Your hair is gorgeous! My hair also takes a long time to air dry so I usually wash it at night and let it dry while I sleep. The outfit is great as well...love the idea of using your lip color for a pop of color. I really love your whole oufit..and super gorgeous hair! Happy to find your blog...I was raised in Surrey, so call Vancouver area my home. I left at 17 yrs old and have lived in the Seattle area many years! Great blog! Oh heyyyy gorgeous! Love this look, that shirt is everything! I love this look!!! 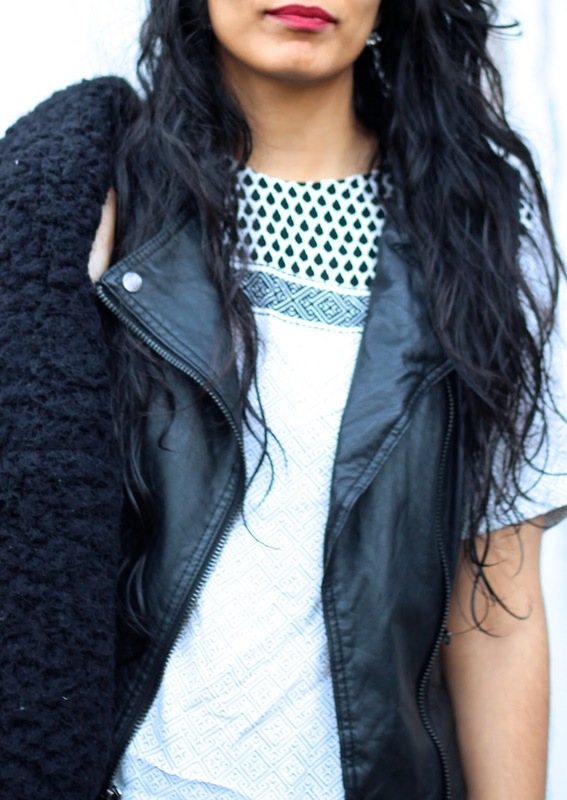 I love an all black and white outfit and that vest is everything, GORGEOUS! You look amazing and can rock that wet hair!! !